For parents, the idea of signing up their kids to ballet classes can be really exciting. After all, what’s not to be excited about ballet? The grace, the poise and the way little ballerinas glide through the stage are all worth looking forward to. However, it’s worth noting that only children of age 8 and above are allowed to receive formal ballet training. Children aged below 8 years don’t have strong enough bones for all the ballet exercises. For safety reasons, some children are only allowed to proceed training ballet when they reach 10 to 12 years of age. If you really want your kids to start learning ballet early, you can enroll them to various ballet classes for all ages. Here at Music & Dance Academy, even toddlers of age 18 months can come along with their parents to learn the most basic skills needed for ballet dancing. Young girls can wear ballet leotards, skirts, tights or any comfortable clothing in which they can skip, leap and glide. Some prefer wearing cute princess or fairy costumes. Just make sure that they can move in these costumes. Some ballet schools may require specific dance attire. Typically, schools recommend close fitting dancewear so they can supervise their students’ movement. The next thing your kid will be needing is a soft pair of ballet shoes. Ballet shoes are generally made from leather or canvas on top and suede on the bottom. Dance studios may suggest buying a specific type or brand of shoes for the entire ballet program. 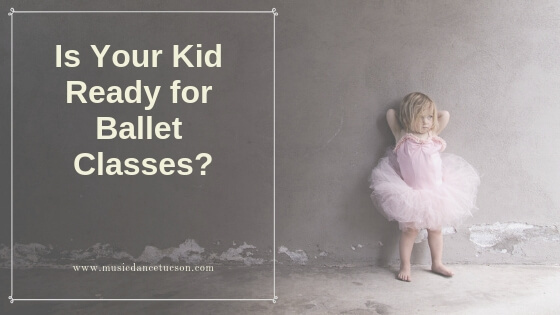 Attending ballet classes may seem exciting but it can be frightening for some children. You know your child better than anyone. So make sure to guide and encourage your child all the way. Feed your child positive and cheerful thoughts about the experience and above all, let them have some fun! Music & Dance Academy offers ballet classes for all ages, beginners to advanced. Our dance program offers classes beginning at age 2 and some of our students are in their 70s and 80s. The academy emphasizes quality and the development of dance technique, confidence and self-esteem through innovative teaching methods to make the learning journey more enjoyable and rewarding for students of all ages.